This multi-transfer coupler from Bitspower can be used as a coupler to change from one size or style of fitting to another. Compatible with 1/2" to 3/8" to 1/4" making reducers or other changes to your water cooling line as needed and with any product that use G 1/4" fittings. 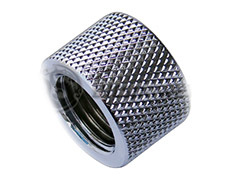 Product Name: Bitspower Silver Shining Muti-Transfer Coupler - Inner G1/4"